Strategic Cities helps Christians find jobs overseas for the spread of the Gospel. A new initiative of Access Partners, we provide resources and connections to help Christian professionals move to global cities that can be strategic church planting hubs in their region. If you’re interested in learning more, fill out our sign-up sheet below to download a City Guide that has more information about living, working, and doing ministry in Dubai or Kuala Lumpur. DUBAI is a glittering oasis in a vast desert, and it’s also the Middle East’s largest expat destination. Around 80% of the city’s 2.2 million people are foreign expats. 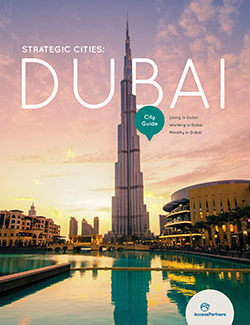 With healthy churches, plentiful job opportunities for Western expats, and unreached people from all across the Muslim world, Dubai is a Strategic City. KUALA LUMPUR is the capital city of Malaysia, and its tropical rainforests, lush green mountains and warm climate make it a beautiful one. 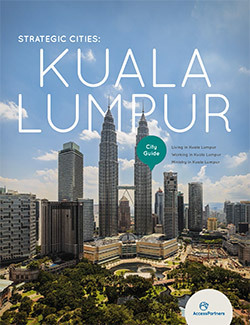 Its diverse ethnic population, many of whom are unreached by the Gospel, and many healthy churches, make Kuala Lumpur a Strategic City. Strategic Cities helps Christians find jobs overseas for the spread of the Gospel. A new initiative of Access Partners, we provide resources and connections to help Christian professionals move to global cities that can be strategic church planting hubs in their region. If you’re interested in learning more, fill out our sign-up sheet below to download a City Guide that has more information about living, working, and doing ministry in Dubai or Kuala Lumpur. Guide: Download one of the City Guides, fill out our application form, and email your completed application to us here. Pastor: Connect us with your pastor and ask him to fill out an assessment form. Job Coach: After your application & assessment are reviewed, we will connect you with a Job Coach who will help you find a job in one of our Strategic Cities. Training: Access Partners will work with your local church to provide you cross-cultural ministry training to help you be fruitful when you move overseas. Access Partner: Go overseas as an Access Partner, join a healthy local church, and get involved in ministry to the unreached! Fill out this form to download the city guides of your choice. When you sign up, you'll be subscribed automatically to our Strategic Cities mailing list so you'll be notified with future updates and information. Why are you interested in a city guide? How soon would you like to move overseas? Strategic Cities has relationships with recruiters in Dubai and Kuala Lumpur and can help you find a job in one of these cities. Submit your resume here so we can start looking for overseas job opportunities for you. © 2019 Access Partners. All rights reserved.